We have had a busy end of season at Glenloy Wildlife, with two full week holidays in October, a bespoke holiday for some welcome returning guests, and a number of pine marten breaks and watching sessions. The good news was that the autumn colours were spectacular this year. The month started off colourfully with the reds of the geans and rowans and ended with the mellowing oranges of the larches. Sadly, the weather was not great, and a couple of storms soon stripped the leaves of many of the more delicate trees, though the yellow aspen proved remarkably resilient. Although the colours were stunning just about everywhere, the back road in Speyside from Rothiemurchus to Insh Marshes took some beating. We managed to avoid the worst of the weather and did our best to keep our guests dry, but inevitably this meant adding on a few miles as we headed east in search of sunnier climes. Nonetheless, our most impressive wildlife watching days were had in Lochaber, with no less than four “Big Five” days close to home. As of yesterday, the red deer were still roaring away on the hillsides, and although the rut has now abated there are still groups of hinds to be found accompanied by a hopeful stag. Conversely, we are now seeing groups of stags happily feeding together, which means that they at least, have given up for the season. At this time of year it is often possible to see some half-hearted tussles between antlered stags, but these are more a test of strength than a fight to the death. Very close views of deer were had on several early morning excursions. There are few more evocative sights in the Highlands than that of a stag bellowing in the early morning mist, or a group of hinds lit by the rising sun. We were also lucky enough to see sika stags fighting, on more than one occasion. 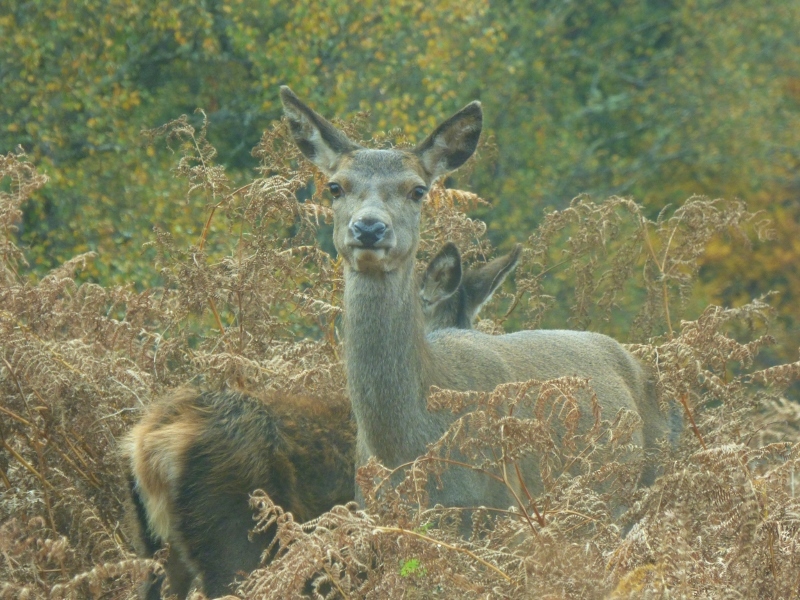 The sika have now donned their very dark winter coats and appear almost black against the bracken. Roe deer were evident, particularly at Insh, where a dozen or more appeared seemingly out of nowhere amongst the reeds. 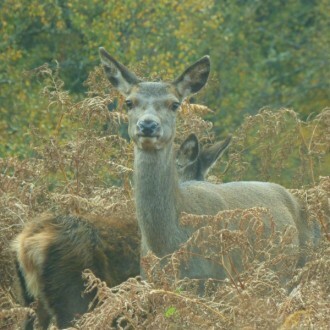 We were also treated to the rare sight of the residents of a local deer ‘menagerie’, which includes the ungainly Pere David’s deer, as well as elk and fallow. With reindeer also showing on Cairngorm this was quite a month for cervids. 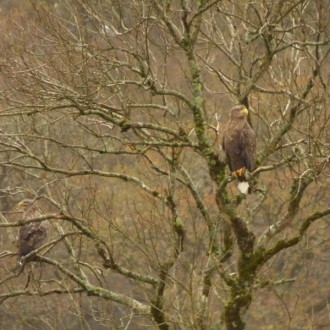 Eagles were also to the fore, particularly towards the end of the month. On Friday we saw no less than 11 sea eagles, including 5 gathered together on the beach at Kentra., albeit some of the flying birds may have joined some of the stationery ones. Two days earlier we definitely had 7 birds, including 4 adults flying above a ridge in the company of a pair of goldies. The golden eagles had previously been displaying, swooping and plummeting with folded wings. 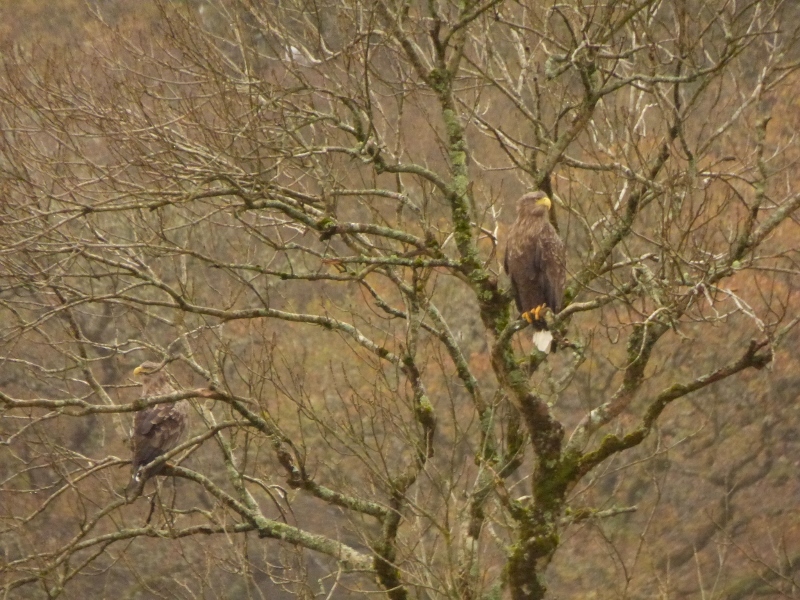 Two more white-tailed eagles perched in a tree, not far from the road, rounded that particular trip off nicely. We were also pleased to see a kite at Laggan, trying to access some roadkill. This is one of the nearest birds we have seen to home, although several birds were also spotted along the south side of Loch Ness, where they seem to be spreading. Other raptors seen included a couple of hunting merlin, one locked on to a panicking pipit. Sparrowhawk families were on the wing, with several birds interacting with crows. On the last day of our final trip we had a nice ring-tailed harrier quartering the moss. Autumn is the time for migrants, and we saw thousands of wintering thrushes passing through the region over the past few weeks, feasting on the last remaining rowan berries and also hawthorn. Great views were had of fieldfare and redwing, allowing ready identification. Ducks have largely returned to the area, with hundreds of wigeon, teal and mallard, although only the first of the season’s goldeneye were found. Over on the Black Isle we were treated to the sight of thousands of pink-footed geese coming in to roost, whiffling down to the safety of the loch. Close by hundreds of scaup had gathered close in to shore as the tide reached its zenith. Across the water a herd of around 40 whooper swans melodically trumpeted as they winged their way to fresh pastures. We also saw flocks of wintering greylag and were particularly pleased to find a small group of white-fronted geese. 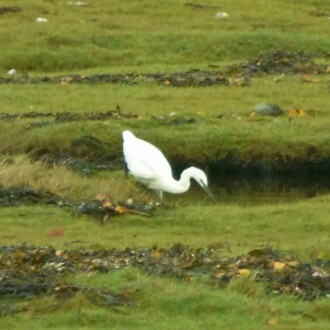 These were feeding low down on the marshes and included a number of youngsters. Other ducks included a flight of scoters, and a prominent female near Arisaig, as well as the beautiful long-tailed duck. A ring-necked duck on Loch Shiel provided an unexpected bonus. Returning great northern divers and wintering Slavonian grebes were seen in relatively large numbers, together with the ubiquitous dabchicks and a more unusual (for us) pair of great crested grebes. 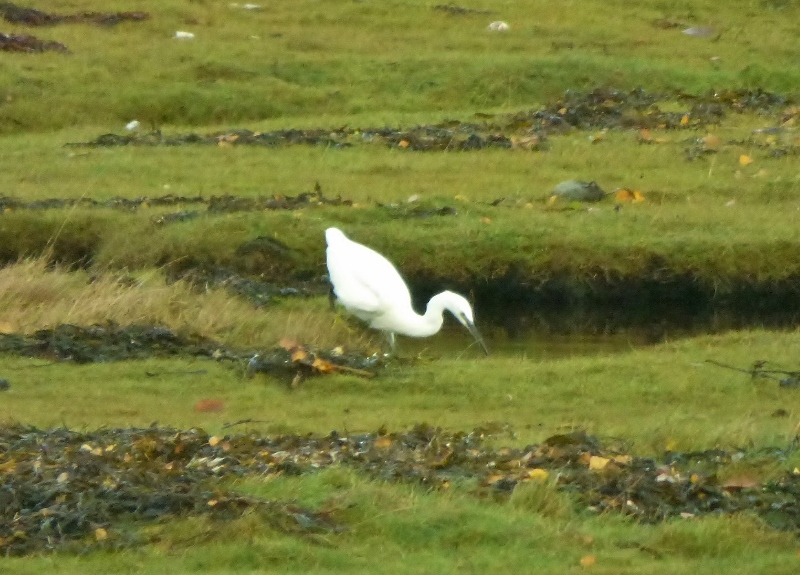 We also had a Lochaber first, for us at least; a handsome little egret on Loch Ailort, which caused us more excitement than it did in any of our English visitors! The last day of our season dawned on the 27th. October, with snow down to around 500m. The day started well with red squirrel on the feeders at Glenloy Lodge. We ventured up the glen in cold temperatures and bright sunshine, and were rewarded with a pair of golden eagles, bellowing deer, several stonechat and a couple of redwings. Back at the Lodge our final guests of the year were treated to the sight of three pine martens squabbling for food. This year’s youngster was accompanied by last year’s male who was being rather friendly. Both were studiously avoided by our resident female, now looking big and fluffy, resplendent in her winter coat. We look forward to many similar sightings over the winter.